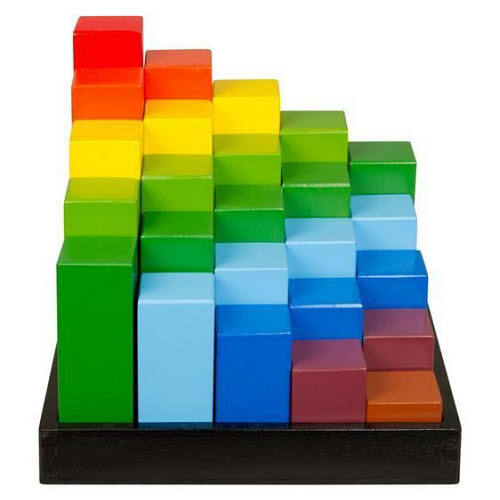 This set of rainbow colour blocks contain 25 chunky wooden blocks in ascending heights. It is great as a set of basic building blocks or a great set for colour, size, weight and order recognition. perfect for creating building structures or whatever your child dream up to improve hand/eye coordination and other sensory skills. Instill interest in shapes and colours with the Engineer Rainbow Blocks. These sturdy, chunky blocks are perfectly sized for small hands and are made from non-toxic materials, making it 100% child-friendly. Suitable for indoor or outdoor use, the versatile game will be an entertaining addition to your child's playtime, keeping them amused for hours, while building up their motor skills.